A Winnipeg teenager's penchant for making animal noises lands him a job in a new cartoon series. Michael Moloney displays his monkey talents from a tree in his yard. 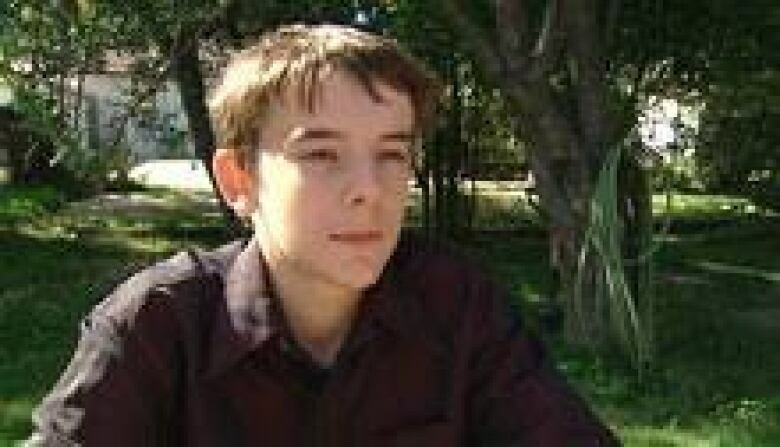 ((CBC))A Winnipeg teenager's penchant for making animal noises has landed him a job in a new cartoon series. Michael Moloney, 14, had his talent discovered in July, when someone from a Winnipeg audio company, Decapo Productions, heard him monkeying around in a tree at the Brandon Folk Festival. Now he's doing the animal sounds for a new animated series called Green Squad, a cartoon with an environmental focus, being produced in France by Decapo. The Grade 9 student at John Henderson Junior High school can do impressions of all sorts of animals: monkeys, squirrels, dogs, baboons, gorillas and raptors. He can also mimic accents of people. "I just watch TV and learn how to do them, and just mimic them. Plus, lots of my friends have accents," he said. Moloney did his first impression, a velociraptor dinosaur he saw in the film Jurassic Park, before he was five years old. Michael Moloney, 14, is doing animal sounds for a new animated series called Green Squad. ((CBC))Over the years his catalog of animal sounds grew. While the adults in his life didn't always find it entertaining — he was often told to settle down and be quiet — Moloney kept refining his skills to the point he can differentiate emotions of some animals. He even played animal whisperer to some baby raccoons that lost their mother and were being cared for temporarily by his family. "The one thing I was discouraged from doing is the one thing that's making money," he said. Nolan Balzer, voice director for Decapo Productions, is pleased Moloney continued to parrot and practice his noises. "We send him an episode [of the cartoon] and the animal he's got to be doing and he goes home and researches it and he comes back and I go, 'Angry lemur, happy lemur,' and he's got to pull it off," Balzer said. "He did a raccoon call once and these raccoons came out of the bushes to him, it was that real." There's no release date for the cartoon yet, but it's expected to get airtime in North America.